Panther Branch. In between Bloomington and Nashville, via SR 46. Follow trail 2 mi to end of Tecumseh Trail. Good vantage point to explore Hoosier National Forest across the Branch. Unofficial trail connects up to Miller Ridge, which extends south (right) to Monroe Reservoir. Across old road bridge long ago closed to traffic over Salt Creek is iconic Browning Hill. Soon this could be opened as the HNF Salt Creek Trail section of the KHT. Avoid in flood. Park at southern Tecumseh Trailhead. Take T.C.Steele Rd. from US 46, 8 miles east of Bloomington. Follow road past Boat Ramp and north 1 mi. to end of paving to parking lot and sign. (National Geographic Trails Illustrated HNF map) Google Map link on Tecumseh Section map: CROOKED CREEK ROAD TRAILHEAD. Options: 3 & 10-mile loops with lush bottomlands, forested hills & ridge climbs. All-season walks—snowscapes–ice across rock shelter opening (photo)–amazing wildflower diversity & fall foliage. See Backpacks for more information. MMSF has many other trails to explore. At the far side of the Low Gap Loop, where the Low Gap Trail turns north (left) you can add on a few miles and some winter fun and continue south (right) on the TT to Bear Lake (photo). 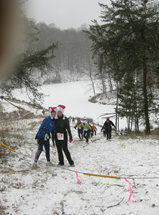 Well-designed trails maintained in good enough condition for both trail running and walking. Park at the Forest Road Trailhead in the Morgan-Monroe State Forest. Exit east off SR37 to the MMSF, 4 miles S. of Martinsville, 25 miles S. of I 465. (You may start at other parking lots along Forest Rd.) (TT map or MMSF property map) Google Map link on Tecumseh Section map: FOREST ROAD PARKING LOT. Indian Hill Loop. Between Bloomington and Beanblossom, via SR 45. Walk 1.5 miles up hill to striking views of open valley to north in winter and early spring; wildflowers last for months from bottomlands to bluff. For a 3-mile loop, bear right where the Tecumseh Trail/KHT heads south, and return by following this graveled logging track out to Indian Hill Rd. and downhill to your car. There’s almost no traffic on this, the steepest road in Indiana, and its deep old “V” road bank puts you at eye level with most of Indiana’s countless spring blossoms. Park just across the RR tracks and Beanblossom Creek ford, going south from US 45 via Indian Hill Rd., 4 miles west of town of Beanblossom, on SR135. (TT map or YSF property map) Google Map link on Tecumseh Section map: SR45/INDIAN HILL ROAD PARKING LOT. Yellowwood Lake Loop. Between Bloomington and Nashville, via SR 46. Trail is so close to civilization, but gives a feeling of remoteness. 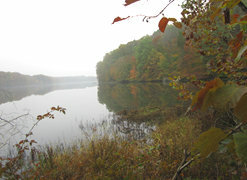 Walking around it you will see beaver dams, lake views (photo), and get some rugged climbs, including Scarce O’Fat Ridge. The east side has a forest resources exhibit; total 5 miles. Add on extra mile for best view on the trail from High King Trail via Scarce O’Fat.Trail. Lots of decaying wood from dead trees of successional forest along the trail yield plentiful mushrooms along the trail: Indiana’s funkiest mushroom (photo), the stinkhorn (watch for the elegant pink ones…). Park at Yellowwood State Forest Office, reached by following Yellowwood Road north from SR46. Sign marks turn-off 8 miles east of Bloomington from turn-off to SR446. (TT map or YSF property map) Trail begins on opposite side of the road; turn left, walk counter-clockwise; the Forest Office is near the south end of the lake on the Google Map. Google Map link on Tecumseh Section map: YELLOWWOOD LAKE. Nebo Trail. SE of Nashville, via SR 46 and SR 135. Popular 8-mile (one way) Hoosier National Forest multi-use mountain bike and hiking trail. Winding, hilly, remote, in area proposed for wilderness in 1970s. Simply get on the trail and follow the bike tracks and trail markers. You cannot get lost on this one! It is named for an early pioneer church with a biblical namesake, near the trail. Remember, all these ridge tops were cleared of trees by early settlers for farming. 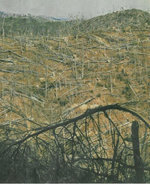 The pine plantations were esta-blished by young Civilian Conservation Corps crews in areas where cultivation was largely abandoned during the 1930s, often due to erosion of topsoil. Many local owners were pleased to have their lands acquired during the Depression by state or federal agencies. The trail ends on CR 1000N, the road to Houston. The Nebo ridge top is a section of the KHT proposed for the route from the Tecumseh Trail end via Miller Ridge. Stay tuned for official connection news! Approach from Story, 9.5 inconvenient miles S. off US 46, from 3.6 miles E. of Nashville. At Story, leave US135 and go 2 miles S. to Trailhead (on left). (National Geographic Trails Illustrated HNF map). Google Map link on Pioneer Section map: BROWNING MTN./MIDDLE FORK SALT CREEK. Motocross-Pioneer Trail Barn Loop. Between Bedford and Brownstown, via SR 58. Scenic, steep trail chugs through a Motocross course; easement donor has graciously provided free access to all the public at users’ risk. Not to worry: this is a multiple-use property, not M-U trail. Bikers are friendly! This section is steep and challenging, and covered with wildflowers, then passes into calm forest following a scoured-shale bottom creek. 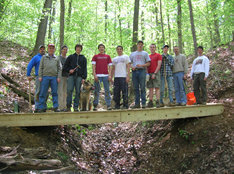 On Dr. Tom’s easement you’ll hike a footbridge constructed by Trafalgar Scouts (photo with Dr. Tom). 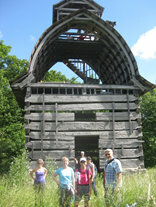 You’ll see Frank Fisher’s restored pioneer barn (photo) to your right when the trail comes briefly to the road (stairs lead to the top of the barn). The route crosses one county road mid-trail, then forest with Eagle Scout-built stiles to cross fences (photo). This easement section ends at this time at a second road. Here, reverse, or chose a road walk (turn left onto road) then left again for a 5-mile loop. KHTA is working on easement connections north and south of loop; stay tuned. From Bloomington, drive 30 miles south via US 446 to SR 58, then, 9 miles E. on SR 58, and 1 mi S on CR 975; park on dirt lot. Look for brown fiberglass trail marker at far edge of lot; follow white tree blazes. Google Map link on Pioneer Section map: MOTOCROSS. Spurgeon Hollow Northern Knobstone Trailhead. Between Brownstown and Salem, via 135. Green valleys, high long ridge walks; loops available but have been logged. Good introduction to Hoosier mesic (moist hardwood) forests, with all the variety of colorful fall foliage and spring wildflowers. From Brownstown on SR 50, follow SR135 12 mi S. to Plattsburg, then E. 2 mi on Rooster Hill, .5 mi S. (right) on Delaney Creek Rd. Look for Knobstone Trail sign on left, to the KT terminus at Mile 42. (DNR KT map). With two cars, and very close attention to the back roads on the map, you can set up a shuttle to the Elk Creek Lake Trailhead near Mile 32.5. [2015: CHECK CONDITIONS FOR LOGGING CLOSURES] Google Map link on Knobstone Section map: SPURGEON HOLLOW. Elk Creek to Leota (KT Miles 32.5—25). West 10 miles off I65 at Scottsburg/Exit 29. Good sampling of iconic high, Knobstone dry knob Chestnut Oak forest trail. Few other trees can handle the stresses of these knobs: heat, poor soil, little water. Deep channels in the bark make these handsome trees recognizable (photo); their wavy-edged leaves resemble those of the once-ubiquitous chestnut. The trees are at the top end of their range here. Many square miles of this type of landscape were obliterated south of here by the March 2011 tornado (See below). Tough but rewarding section to hike. From I65 take Exit 29 at Scottsburg, drive10 mi W. on SR56; then 2 mi S. on Elk Creek Rd. to the lake. (DNR KT map). Google Map link on Knobstone Section map: ELK CREEK. Jackson Rd. Trailhead (KT Miles. 5—11). 9 miles west of I65 at Memphis/Exit 16. Once the most scenic section, steep-sided, with access to now bare Round Knob, this is the part of southern Indiana devastated by a monster tornado in 2011 (photo). Views all the way to Louisville are still there! Visit periodically and watch the vegetation recover. Q: will the chestnut oaks ever return? Hike north from KT Mile 5 to the distant views east from the Table Rock area, just before Mile 11. Turn back before the steep stairs at Mile 11 at the crossing of SR 160, as they are extremely steep and dangerously eroded and should be closed until replaced. A shorter, loop version: hike north from the Jackson Road trailhead to Mile Marker 7. Glimpses of Louisville are possible on the far distant horizon at many points along the way. In a few more minutes, you will come to a small rock bluff, with good views and 100-year old grafitti from Pioneer picnickers. Lovely camp if you have water. From here the trail moves north steeply downhill; skip this, and walk back to just beyond the marker. Twenty yards through the trees (path may be visible) will take you to the old Jackson Road that the early picnickers used for access. Turn left, and enjoy a level, forest hike back to your start. Along the way, views of Round Knob are available just by ascending the little bank along the road. Take I65 Exit 16 to Memphis; go west on SR 160 across I65. Go west 2.3 miles on Memphis-Blue Lick Rd. and turn left on Bartle Knob Rd. Follow Bartle Knob for about 6.3 miles. After you pass Mountain Grove Rd., be sure to bear right at next intersection, as Bartle Knob makes a sharp turn NW (road going SW here is Reed Rd). After a steep climb, Bartle Knob Rd. crosses the KT and then comes to a T or fork. Leave Bartle Knob here; it makes a sharp left; you continue right (N) onto Hilltop Rd. (watch for KT post). Follow Hilltop .3 miles then turn right on a gravel road and continue for .2 miles to the Mile 5 trailhead parking. (DNR KT map) Google Map link on Knobstone Section map: JACKSON ROAD.